There is nothing finer than the authentic flavor of a wood-fired pit barbeque. Who says, "You can't take it with you"? All PORTA-GRILL® models are adaptable to mobile units. Now you can take the profit machine with you on the road for practically any grilling event. This unit is built with fire grates, adjustable from 4" to 15" below the cooking grate. Each end of the firebox has doors for easy clean-out and draft control. Under slung spring axle and 4.8" x 12" tires absorb road bumps, delivering a smooth ride behind any vehicle. 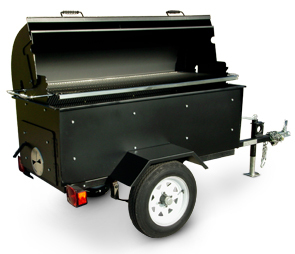 The trailer body is built of tough 1/10" thick 12 ga. steel, finished in a non-toxic, heat-resistant black enamel. These units are fully equipped with dual tail-brake lights, 1-7/8" coupler and a swing tongue jack. Firebox has a double wall. 1/10" thick (12 ga.) steel exterior cabinet with a 3/16"Liner. The PORTA-GRILL® Pit Barbeque has a Bread-Box Hood with thermometer included. The massive 10sq. ft. sanitary nickel-plated cooking grate is made from 1/4" and 1/2" round steel bars and it easily adjusts to four different cooking heights with Cool-Spring safety grips.